The Surviving Not Thriving PhotoVoice Project — Watershed Productions Inc.
With funding from the Canadian Institutes of Health Research and the Vancouver Foundation, the BC Non-Profit Housing Association and the BC Society of Transition Houses have conducted groundbreaking research on the barriers to affordable housing for women leaving abusive relationships. 45 women across BC participated in the project, taking over 500 photos of their experiences related directly to their daily lives. Then, with facilitation from local research coordinators in 4 different communities, the women gave voice to each photo through a recorded testimonial. This research methodology, called PhotoVoice, is a powerful tool used, most often, by academic researchers looking to get real insight into a social issue, with particular focus on disempowered groups and those individuals that experience systemic oppression. The data and findings of this project have been synthesized into final report entitled “Surviving Not Thriving: The Systemic Barriers to Housing for Women Leaving Violent Relationships.” Watershed Productions was asked to create a video that would complement a facilitation guide so that the research could be widely shared with policy makers, city councillors, and community members in an effort to create social change around the issue of affordable housing for women leaving abusive relationships. The final video will be launched in March. It focuses on 9 photos from the original set of 500 paired with voice overs from women reading the testimonial that matches each photo. 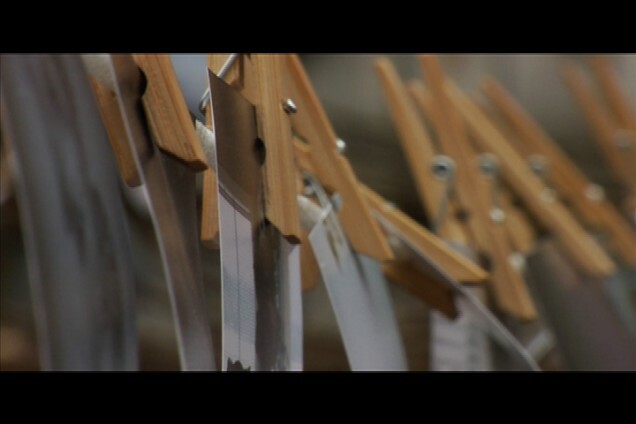 The opening and closing sequences of the video reveal a series of clotheslines hung in an empty city lot, with the entire collection of photos strung up, in a powerful visual testament to the collective experience of the women who participated in the PhotoVoice project. Posted on February 3, 2012	in Filmmaking, Resource. Bookmark the permalink.